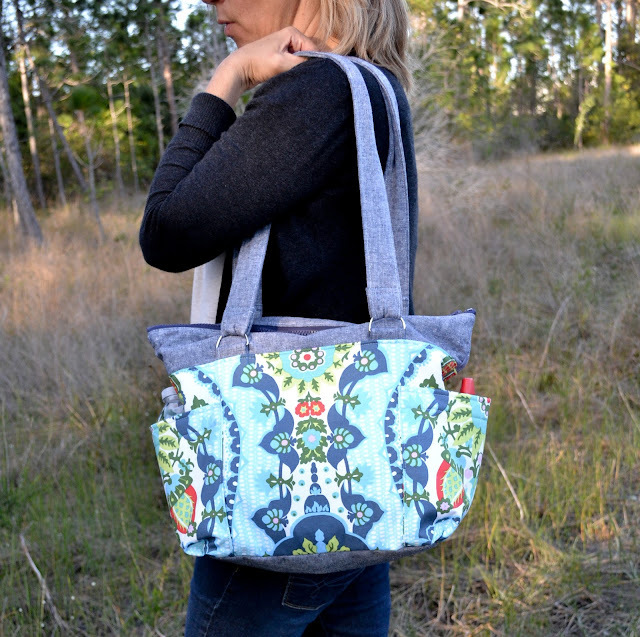 Hello Sewing friends! 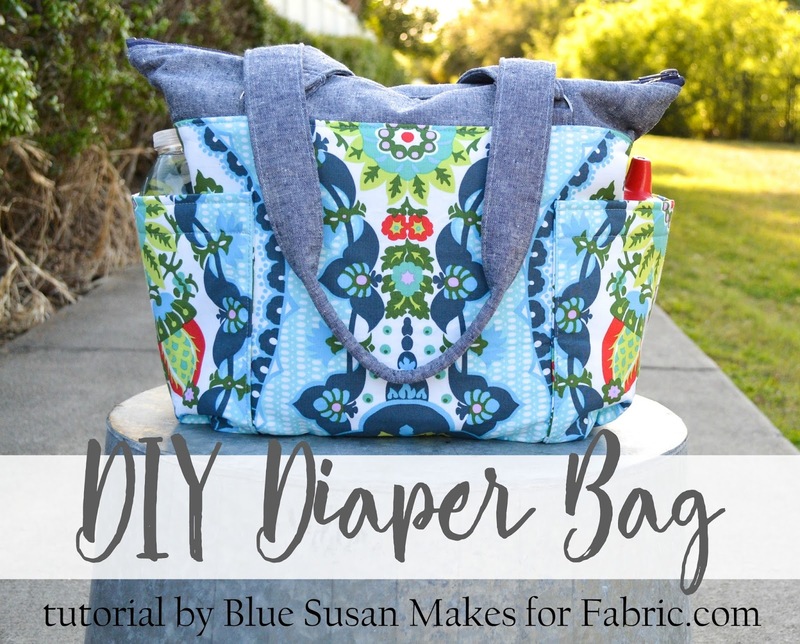 I hope you had a chance to catch my DIY Diaper Bag tutorial up on the Fabric.com blog. You can hop over there to check it out the full tutorial but first let me give a little preview here. 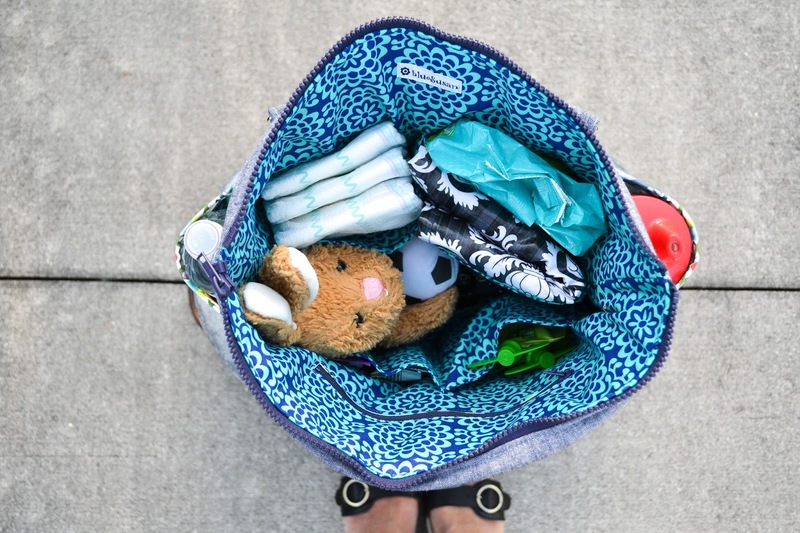 This diaper bag is not quite full sized (more on the small to medium size) but it still has all kinds of awesome pockets. My favorite ones are on the outside. 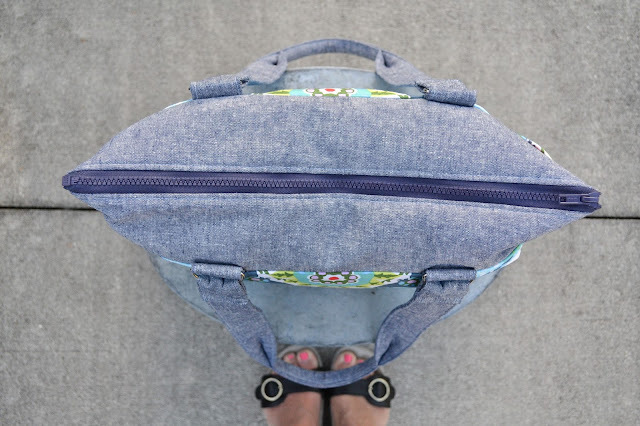 I love bags with pockets like these. I stash my phone and keys there so they are easy to grab. There is room for more than just a water bottle in there. There is an easy to install separating zipper to keep everything in place. 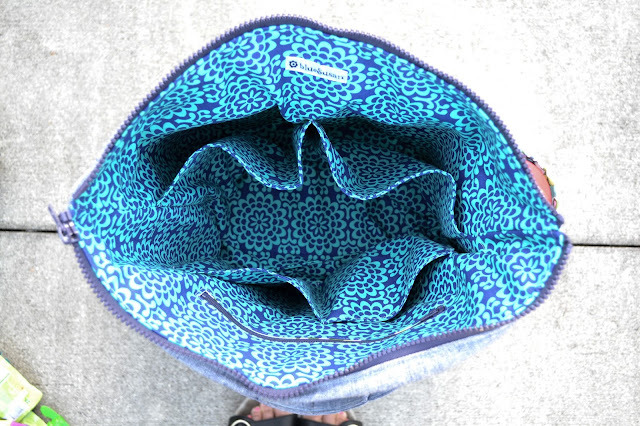 Open it up and you'll find lots of pockets. 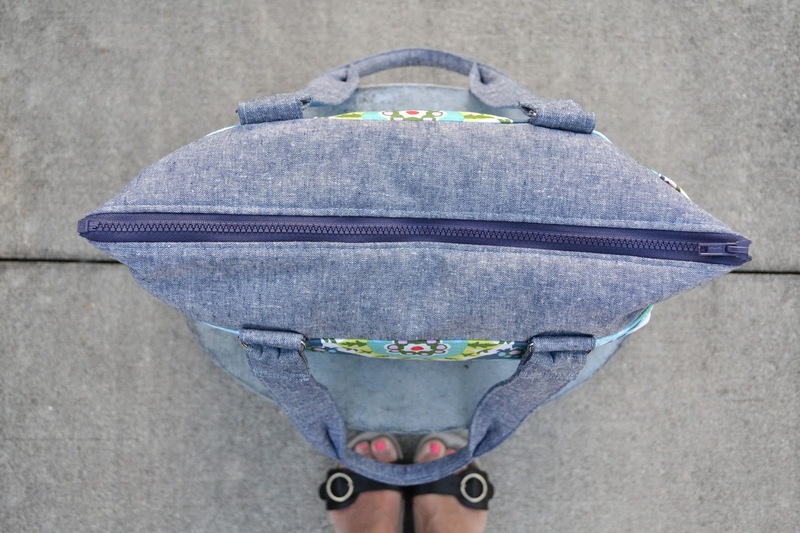 2 large, 2 medium, and a even a zipper pocket to stash the things you don't want to lose. Here's what it looks like all stuffed with the essentials. The straps are long enough to easily throw over your shoulder one handed. But honestly I would just leave this one in the car on outings. It has a nice big base so its stays standing up pretty easily. I love this fabric print too. To me it just screams spring. It's an Amy Butler print called Harriet's Kitchen Sugar from the Cameo line. Amy Butler is the queen of large scale florals. Here's a tip, when you are using a large scale floral when making a bag order at least 1 1/2 times the fabric you are going to need (maybe more) so you have enough to fussy cut and match your panels. I only started with a yard for this project and wasn't quite enough to get the flowers placed where I wanted them. For the lining I used a coordinating print from her True colors line called Wallflower in Marine. For the handles and base I used Essex Linen by Robert Kaufman. It is my go-to fabric when I need a neutral for a bag. Anyway, I hope you like it! I hope you sew one and let me see it when you do, I'd love to see it. 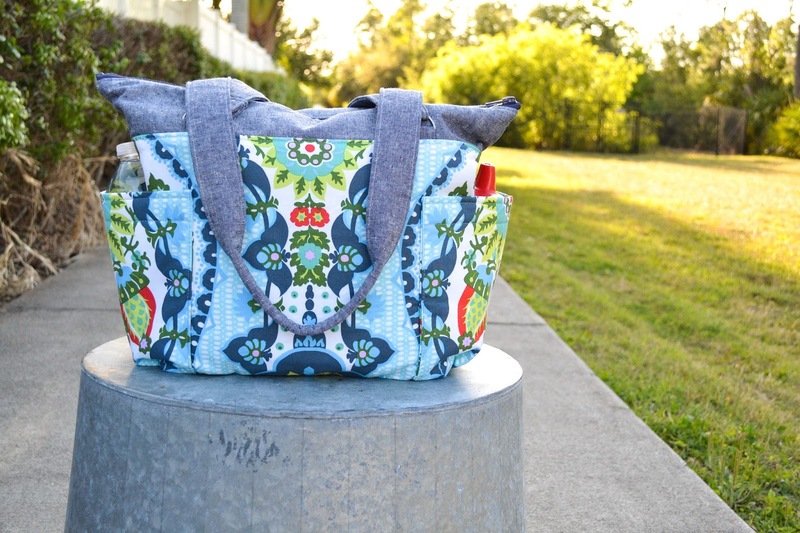 I love this diaper bag and have been looking for a smaller sized one forever. I would love to use faux leather for the accent pieces. Do you think it is necessary to use the fusible fleece if I were to use faux leather? Hi Susan, Great idea! I don't think it would be necessary to use fusible fleece the faux leather parts. Good luck! I'd love to see it when you are done. Just made this for my expectant first! I've never done anything like this before but I'm so amazed with the outcome. Hi there. Just curios if you have the finished dimensions for the bag? 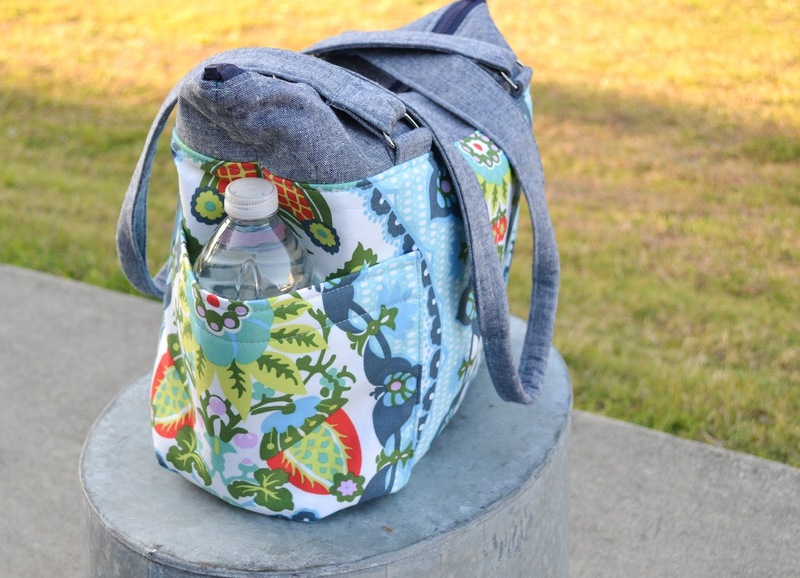 I would like to tweak it a bit to make it bigger and use it as a gym bag. Very nice pattern, Thank you!!! !